Update: Microsoft is now rolling out Windows 10 Mobile build 10.0.14393.221 Release Preview members. The company did not release changelog yet, but the new update will bring bug fixes and improvement to Windows 10 Mobile. Original story: Microsoft Windows insider team is working on next update build 14393.221 for Windows 10 Anniversary Update users. The upcoming patch will push Windows 10 1607 Anniversary Update build from 14393.187 to build 14393.221 and mobile build 10.0.14393.221. 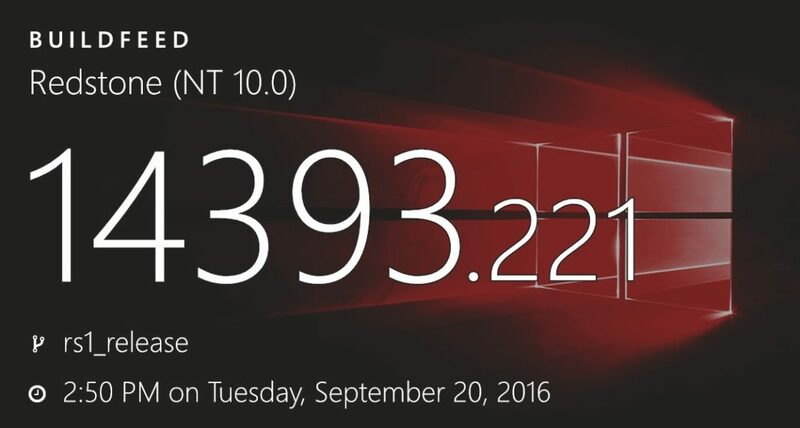 The latest update build is compiled on September 20, 2016. Recently, Microsoft had released a cumulative update kb3189866 build 14393.187 for Windows 10 1607 users and Mobile build 10.0.14393.189. The company had also released Redstone 2 build 14931 for fast ring insiders.